Shoes can be difficult presents to give. What if you pick the wrong size? What if they need a cross trainer and not a running shoe? What about walking shoes, they might need those, too!? And who wants to ask their gift recipient tons of questions about what they want under the tree? That intense Q/A would give it away! Then there would be no surprise on the big morning. You can solve all of these issues with an NB Web Express gift certificate. Plus, they are super convenient; these gift certificates can be emailed directly to your gift recipient. You can also send them U.S Postal Mail, but please allow 3-5 business days for delivery. 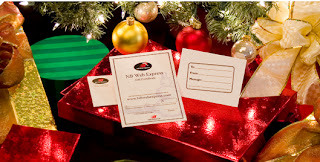 So, get them a gift certificate and let them choose their "Perfect Fit" this year on NBwebexpress.com!